After reviewing Nick Redfern's Nessie book, I realised I had a couple of items to post. This was mainly inspired by Nick's investigation into other strange phenomena that haunt the general Highland region and may or may not have anything to do with the Loch Ness Monster. The first of the two items is the Am Fear Liath Mor or Big Grey Man which is said to inhabit the area around Ben MacDhui in the Cairngorms mountains. This spot lies over 30 miles south east of Loch Ness. 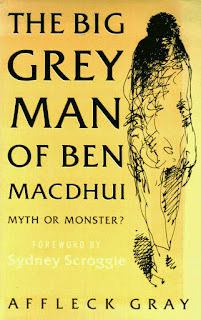 The Grey Man is a phenomenon that is more often heard than seen amidst the lonely peaks. However, a friend of Nessie sceptic, Richard Frere, did claim to see a large, brown humanoid figure heading down the hill. A Scottish version of Bigfoot or something that has a more normal explanation? Affleck Gray was the man who wrote the definitive book on the subject in 1970 entitled "The Big Grey Man of Ben Macdhui" and back in July I stumbled upon an interview with him in a magazine found in a Stornoway shop. The magazine was the Spring 1995 edition of "Tocher", which covers various Scottish folkloric and cultural subjects. 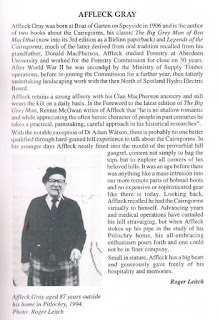 The interview was conducted by Roger Leitch in 1994 when Gray was 87 years old. He died two years later in 1996 and so the interview probably gives us his last thoughts on the subject of the Gray Man and other matters. The scan of the pages can be viewed at this link. I will post the second item on a possible UFO report from near Loch Ness presently.